Heading off about 0700, it took 14km to be free of the city. There were many detours due to roadworks which made it more the trickier. I have to admit the divers here are great, so courteous , a horn is used to let you know I’m behind you or whatever. Very rarely are the used as an aggressive gesture. When you have horses and carts in the middle of the city, a relaxed ambience on the road exists. Once out of the city it was more sugar cane and flat, good time was made. 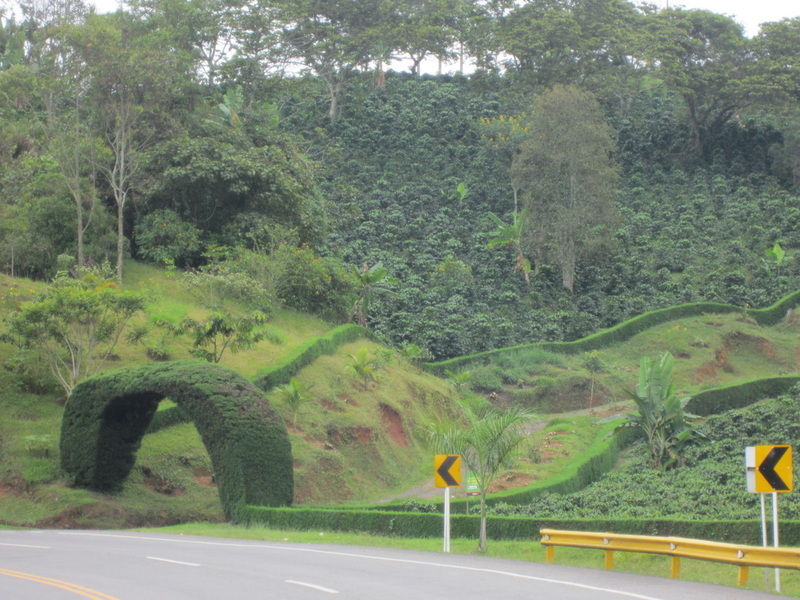 Soon the crossed the Rio Cauca. The Departmento of Cauca had been entered. Here the FARC have a bit of a presence. The military were now on the road at most bridges and had sandbagged posts on both sides of bridges. Walking up one hill, stopping to talk to a few military guys, really young I might add. They were so helpful, one had a teargas launcher and the other two a couple of machine guns. I stirred them about the age of the weaponary, they assured me they used it often, in practice. 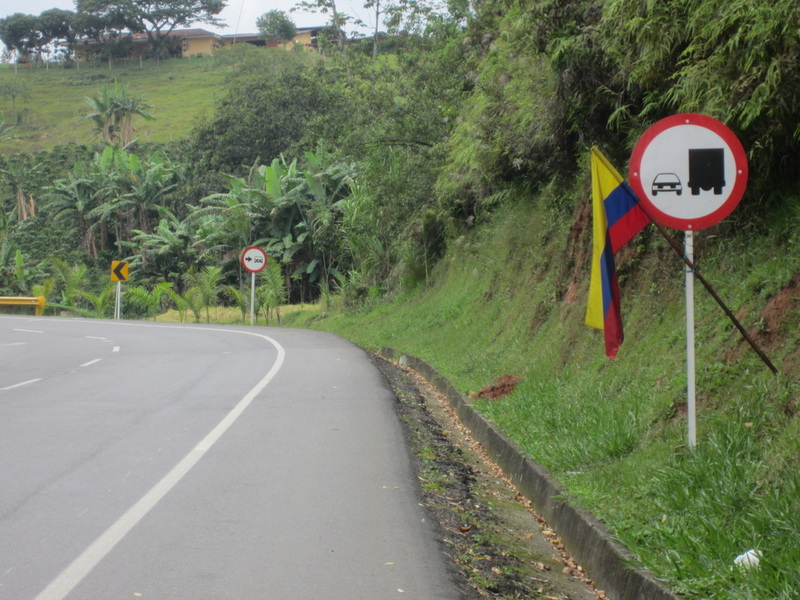 Each inspection point was marked by the Colombian flag roadside on approach and departure. The first 50km was flat, the last 50km to Piendamo was bloody gruelling. It was humid and the hills went up then one would have a run down hill before it was all repeated. Walking was the order of the day for some parts. Fruit was enjoyed were ever possible so was a few sodas. 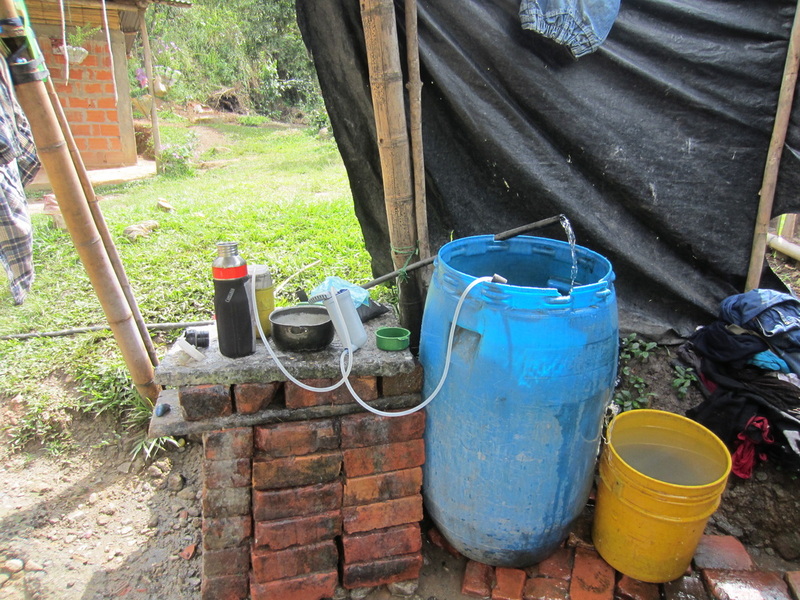 Water had to be filtered at one house, that the owner kindly let me help myself to. Reaching Santander at 1000, it was decided to go on. (before the hills started) One figured that time was aplenty. One did not figure how hard it was going to be. It was quite cool in the late afternoon, then a heavy shower hit, moving was necessary to stay warm. Keeping my raincoat readily available on the back helps retain heat when in a stall eating or drinking or just resting. About 1500 hours cramp started affecting both calf muscles. It must have been amusing to passers by to see a guy with one leg pointing forward, foot pointing stretched like a ballet dancer, whilst straddled over the bar of a bike. It would take a minute to get it back into any position that would accommodate the need to continue cycling. Concern came to mind, as did the time or lack thereof before dark. Finally Piendamo came into view, turning off the main road at 1700, light was still about though the overcast sky made it alot darker than normal .A motel was found, a very humble affair, $5 a night, nothing much else was in town. My room was a painted cave. Being at altitude the shower water was very cold, I mustered the guts to get under it as trashed as I was. The need was there before my body cooled off too much. Doing so, then immediately rugging up in the warmest clothes I had. My hands were very cold with fingers not indicating touch. A superb dinner was had in the very rural town, in the rain. Like everywhere the locals were really friendly. Back at the hotel, climbing into bed fully clothed was the only option to alleviate reigniting that throat cold the has really only just fully departed.